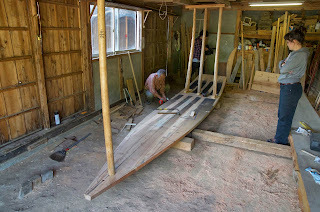 Yesterday was exciting, as we bent the bottom using a process called yakimage, which is best translated as “fire bending.” This is a well-known technique in Japan although not many boats have their bottoms bent in this way. 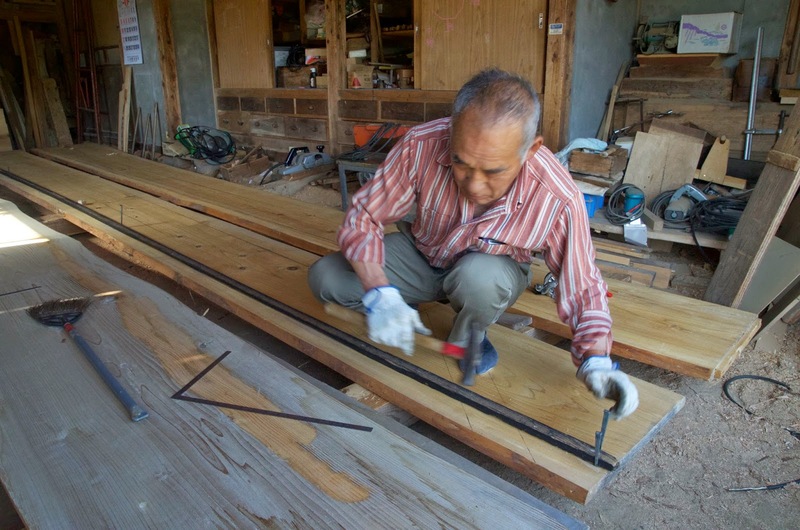 Usually yakimage is done to bend and twist the garboard planks. 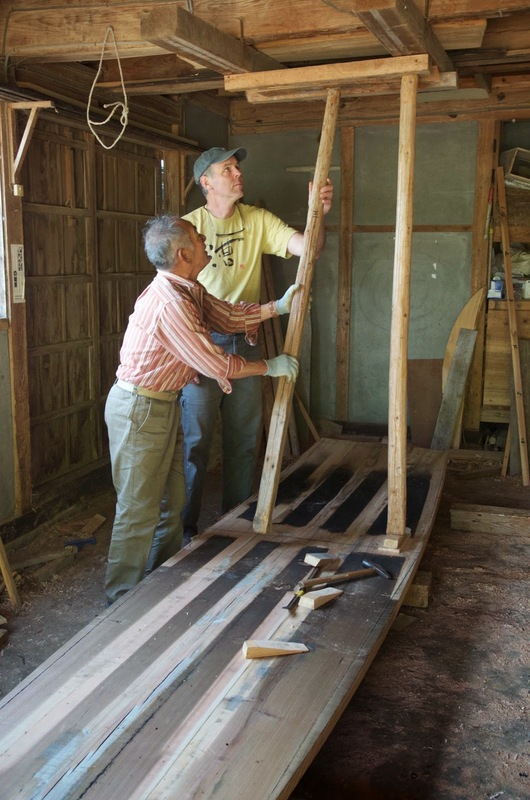 It took exactly 90 minutes to bend the bottom, which is almost two inches thick. Once finished we left it there for about three hours, turning to the layout of our side planks while we waited. Then we rushed the bottom into the shop - it was straightening as we did so - and propped it into place using stout poles against the shop’s framing, and bending the timber with a car jack. 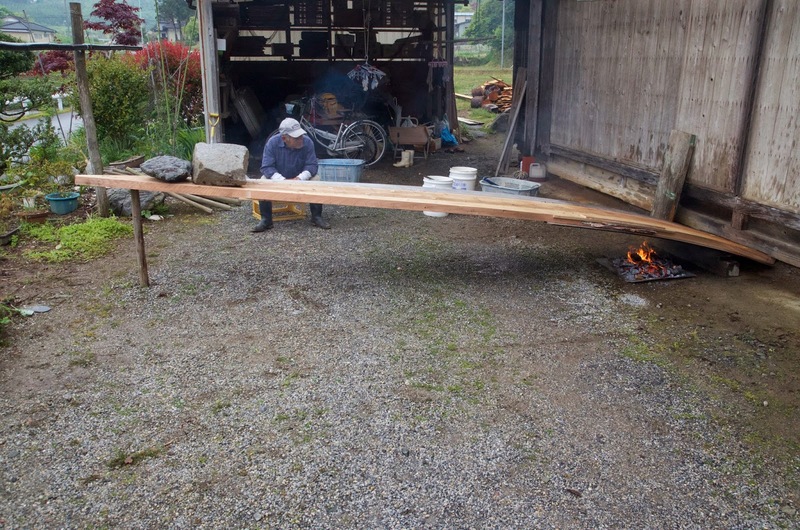 Murakami san moved very quickly to prop the plank, so I guess the benefits of fire bending wear off quickly. I simply don’t understand the physics of it well enough. Over an extended lunch break (we were giving the bent bottom time to take its shape) we watched two TV programs about Murakami san. 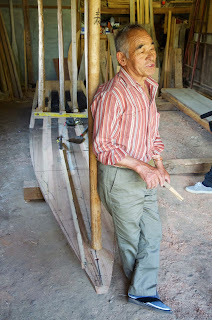 We also talked a bit about his past and he said his father was a boatbuilder and he had studied with him. They didn't get power tools until about 1965 but even using only hand tools they could build an isobune like ours in about ten days. He recalls building about twenty boats a year. 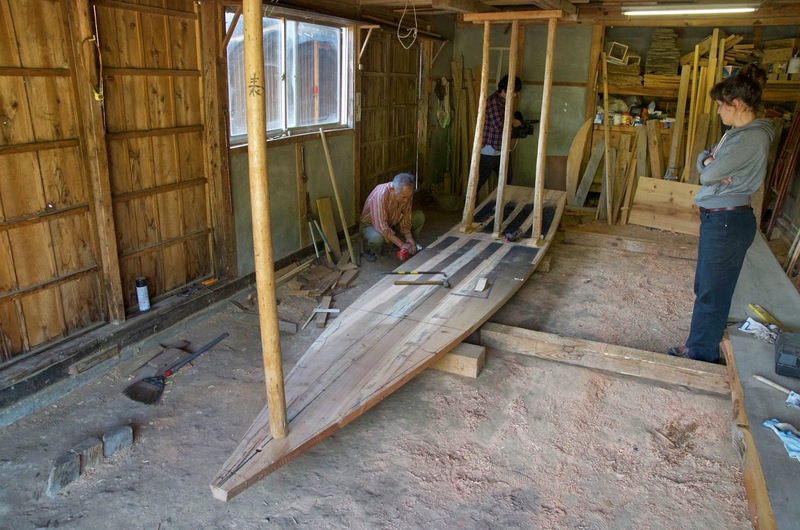 He told me prior to this project this would be his final boat, one that he plans to keep and use for fishing, but then his wife interjected and basically said that the idea of retirement has been revisited several times, so one never knows. 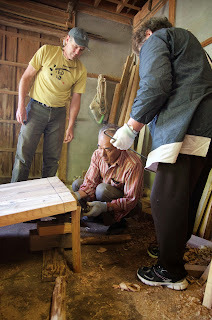 Angela looking at the bottom propped under one of the carrying beams of Murakami san's house. Murakami san and his wife slide a huge stone up the timber to provide pressure for the bending. 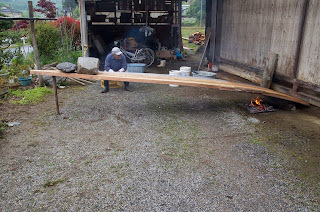 Over a period of 90 minutes Murakami san removed props, replacing them with ever shorter ones, allowing the plank to drop under the weight of the stones. He had these props saved for this specific task. 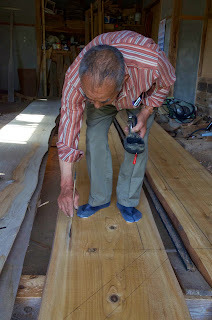 While allowing the plank to cool we got out our material for the side planking. These planks are nearly two feet wide and almost twenty-three feet long. 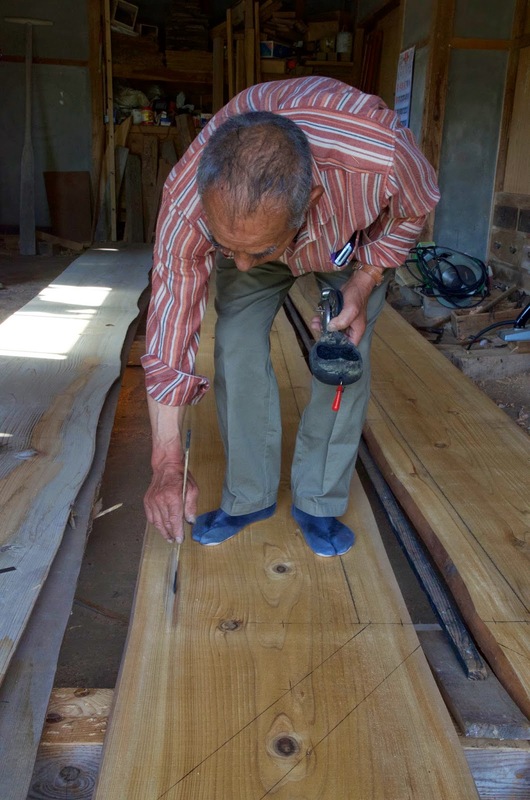 Murakami san calls the wood "Kesen sugi" meaning Kesen cedar. 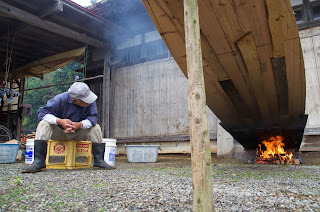 Kesen is the name for this region. We rushed the bottom into the shop. It began to spring back immediately and Murakami was hurrying to prop it against blocks on the earth floor of his shop. Again, I noticed these were specific props he had for this purpose. 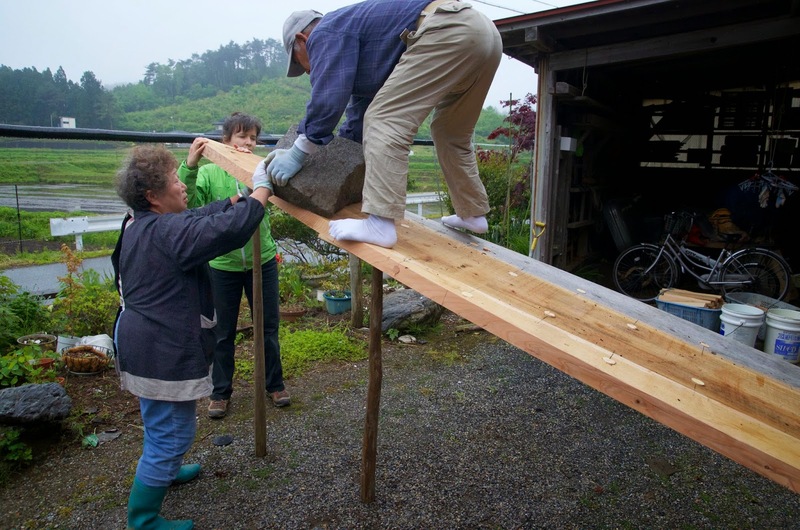 Using a car jack he lifted the stern back up and propped it. 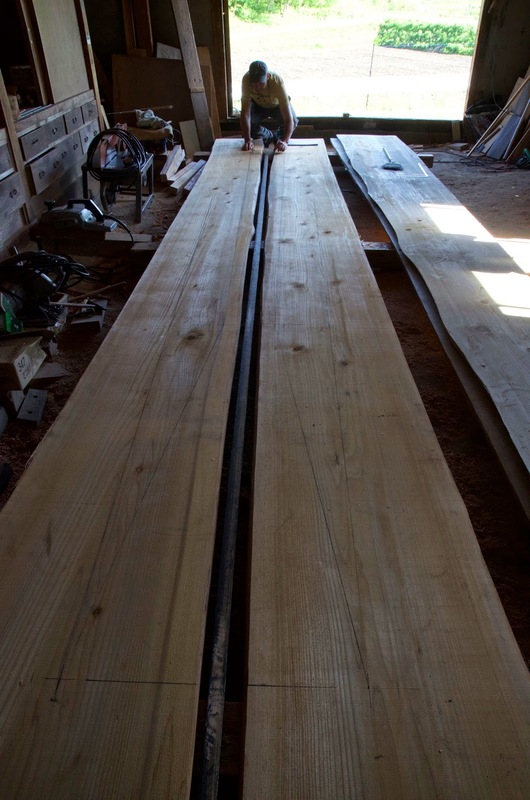 Even though it was pre-bent this took an enormous amount of force. There is no way anyone could do this in a shop that didn't have stout framing to prop against. 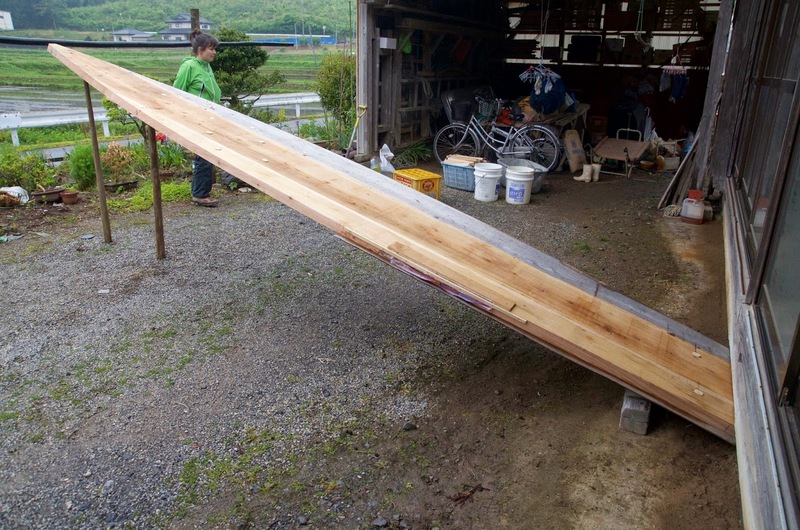 The bow of isobune are pushed down about 2-1/2 inches. This gives these boats better ability to track straight when underway.